Years of experience with many successful interior design projects has enabled Marta and her team to deliver outcomes that both the client and our team are proud of. The overarching goal is always to interpret a client’s needs into an effective solution for them. Highlights of this process involve developing a plan, creating concepts with an approach that works, selecting furnishings, lighting, and finishes … all while overseeing and executing every step of the entire process and acting as a liaison between suppliers, sub-contractors and all those involved. Marta is absolutely the best designer I have worked with, and she is the best with modern design that I have ever seen. Below we’ve detailed aspects of some of the key phases involved in a successful engagement. Your project may not require all these phases. However, we think it’s important for you to know how our process works and understand how Marta and her team of experienced Interior Designers can help you with many aspects of your interior design and decor. All of our engagements begin with a site and project analysis phase. We complete an assessment of the type of interior design project involved so we can create a comprehensive plan and project outline. This includes understanding your vision, style, and budget. We establish a timeline and hierarchy of elements that will change. Some interior design and home renovation engagements require changes to the interior architecture. Making changes to the interior architecture can make a big impact in the home’s overall traffic flow, openness, functionality of rooms, and of course aesthetics. Changes to the interior architecture can include: Redesigning or changing the purpose of a room; manipulating a building’s spatial layout; adding walls, partitions, ceiling plans and even floor levels; eliminating walls to open up floor plans. Every project begins by measuring the existing space, and then preparing an AutoCAD drawing which details the location of walls, doors, windows, cabinets, etc. Our team then critically evaluates the existing space versus the client’s needs and vision for their new space. This is a big-picture analysis, where various options are considered by making changes within the AutoCAD layout. 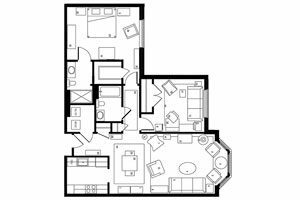 Considerations include improved use of space within existing rooms, relocating rooms, structural and architectural improvements, style, budgets, and other design elements. After we have met with the client, completed the site analysis, and understand the feasibility of changes to the interior architecture, our team moves to the conceptual design phase. Key inputs to the process include the client’s wants, needs, lifestyle and priorities. 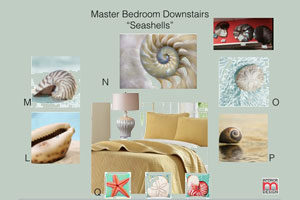 We use these inputs to create the interior design concepts that are presented to the client. 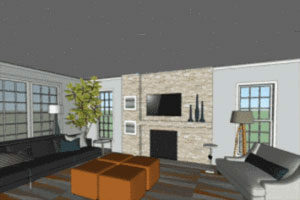 These conceptual interior designs are unique for each and every client and can include everything from spacial layout, architectural changes, paint colors, furniture, floors, fabrics, cabinets, countertops, accessories and more. 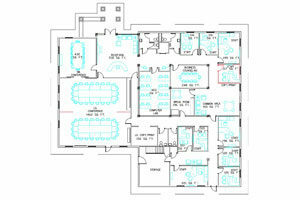 An accurate and current scaled floor plan is crucial for almost any size project. 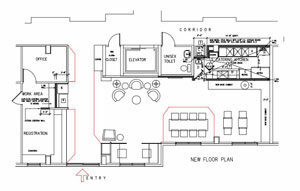 The plan allows for our interior designers to see the scope of the project, any limitations, and explore opportunities. It is far less expensive to make changes at this stage of an interior design project rather than after construction begins. Accurate plans are the foundation of many layers of planning and enable effective communication between the client, the interior designer, suppliers and all sub-contractors involved. Planning a space by using the latest technology and CAD programs is an important part of the professional interior design process. Time spent in this planning phase is time well spent! Working through the furnishing layouts digitally, allows our interior designers and clients to effortlessly make changes. It not only facilitates creativity but also saves time and expense by making design changes before construction begins, thereby avoiding costly errors. From these CAD drawings, we can provide 3D renderings. Be sure to look at our examples of 3D renderings (link will open in new window). 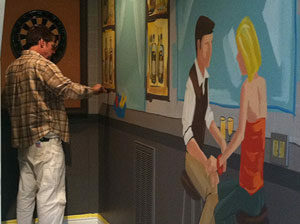 The Marta Mitchell team uses the latest high-tech graphics software to create realistic, full color drawings. 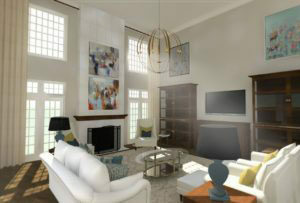 These renderings provide a photographic quality image of the finished space. The client can see the proposed design and exactly how the completed project will appear. Any changes can be updated quickly and inexpensively prior to construction. Click here to see samples of renderings along with the before and after from some our most recent projects (link will open in new window). 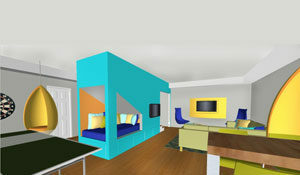 You can also read our Blog on how 3D Renderings help the Interior Design Process. While 3D renderings are an excellent way to communicate design concepts, digital 3D modeling and a digital walk-thru are the ultimate way to ensure design concepts are understood by all before any construction ever begins. Our technologically advanced 3D programs enable clients to travel through the designed space and view it from every angle (both interior and exterior). 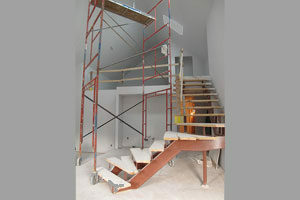 Changes to architecture, walls, furniture, fixtures, paint, and accessories can be made quickly and easily. Visit our 3D Modeling gallery for examples of how we use 3D Modeling in our interior design process. Artwork and accessories are an important factor to ensure you achieve the desired look and style. Many factors go into selecting artwork and accessories that give you that “pop”. 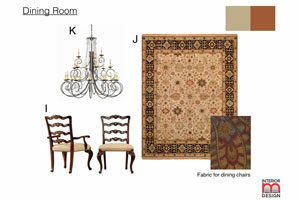 Scale, colors, finishes, arrangement, grouping, and style can make the whole process a bit intimidating. Marta and her team can help you select these important elements and ensure they are installed properly to achieve the desired look. We know the process of making your selections can be daunting. Marta and her team help make this process much easier. We have curated a large network of resources and suppliers over the years and we know which ones to turn to for each project to help clients make the best choices for all aspects of your design. We present you with options we believe will work. Upon approval of selected items, we provide detailed specifications to builders, subcontractors, and architects to ensure efficient and smooth implementation. Colors and finishes likely cover the largest area of the space. Floors, ceilings, and walls need to all play well together to achieve the desired style. Selecting palettes and colors is often intimidating to many. Marta and her team bring their knowledge to the table and actually help make this process of selecting colors not only easy, but actually fun! This saves time and helps ensure an ideal outcome for a color scheme that compliments other factors that might be involved in the space. 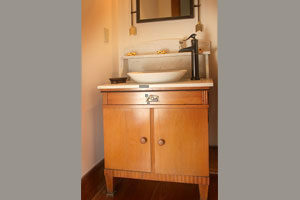 Unique, one of a kind furniture pieces often add that finishing touch to a space. Most often we find just the right selections from our network of suppliers. But occasionally, when a situation calls for a unique piece, we turn to our network of quality craftsmen to get the job done. Skilled at the art of creating unique pieces in shape, style, form, length, width, height, fabric, trim, or finish. Skilled craftsmen they are and they never disappoint! 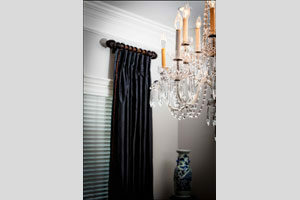 There are so many amazing options for window treatments today. It’s easy to get overwhelmed with all the choices in the design and functional aspects. Marta and her team walk clients through the selection process to ensure we bring together the best in both form and function for all your windows. We consider the key elements of privacy, sound, light diffusion, heat reflection, softness, technology, and of course the visual and aesthetic components each room needs. We can sketch unique designs for each individual project. We also ensure precise measurements and professional installation. Lighting can completely change the look of a space. And there’s no doubt that selecting lighting has become a bit more complicated. This is mainly due to the many, many lighting options available. Technology and automation now play a strong role in lighting considerations today … in commercial environments and home environments. Different areas in a space require different types of lighting. Marta and her team stay up to date on the latest lighting technology, energy efficient fixtures and products. 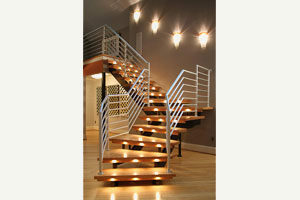 This enables the team to provide you with an effective design plan for custom lighting for each room. Installation is most definitely the “last mile” in an interior design engagement … but certainly one that is most critical. 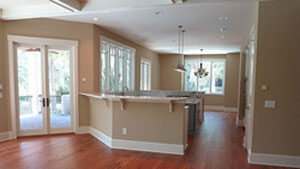 A typical project brings together many trades, skill sets, suppliers, and sub-contractors. Ensuring clear communication and smooth execution among all involved is key to success. Our team visits the job site regularly to check on the progress. Doing this allows us to ensure the design concept is being carried through correctly, catch mistakes early, and help avoid costly and untimely revisions.